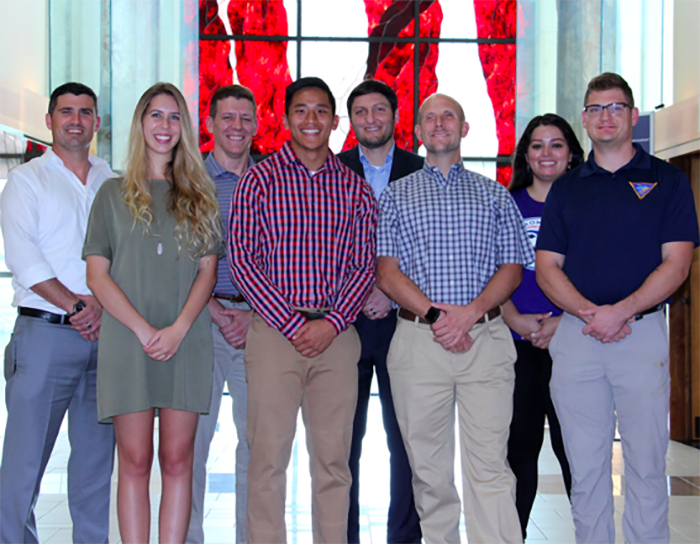 LAWRENCE — The University of Kansas’ Office of Graduate Military Programs has announced that eight students have received the university’s Wounded Warrior Scholarships for the 2017-2018 academic year. Recipients of the scholarships receive up to $10,000 per year and are renewable for up to four academic years. The scholarships assist injured veterans and affected family members in meeting the financial challenges associated with pursuing a college degree. The many donations made to the KU Endowment to benefit the KU Wounded Warrior Scholarship Fund make these scholarships possible. Joshua Blake received the KU Keener Foundation WWS. Blake is a native of Larned and enlisted in the U.S. Marine Corps days after the 9/11 attacks. He served four years as an infantryman, including two deployments to Iraq. In 2004, while serving on his second combat tour, Blake was wounded by an IED while on a dismounted patrol in Ramadi, for which he received the Purple Heart. Josh Blake and his wife, Lacey live in Baldwin City and have five children. He is currently a junior in architectural studies. Luke Dercher is a KU WWS recipient. Dercher is a native of Bonner Springs and served in the U.S. Navy as a Seabee for five years, attaining the rank of E-5, second class petty officer. While in training as a Navy diver candidate, Dercher received injuries that resulted in him being medically discharged from the Navy. He subsequently returned to the Lawrence area to be close to family, rehabilitate from his injuries and attend KU. Dercher is a currently a junior in computer science and has already worked for the Navy, Garmin and NASA as a software engineer. Arnold Dinh is a Vietnamese-American who grew up in Liberal. Dinh is the recipient of the Heart of America Patriot Foundation WWS and the Delbert Moore Family WWS. He served two combat tours of duty with the 1st Division, 3rd Battalion, 7th Marines in Afghanistan as an infantryman and sniper team member. Following his second tour, Dinh was honorably discharged from the USMC but still suffers the physical and psychological injuries he sustained in war. Dinh is a senior pursuing a bachelor’s degree in biology and following graduation plans to attend dental school. Jimmy Gentile is a native of Lee’s Summit, Missouri, and the recipient of a KU WWS. Gentile served with the 2nd Battalion, 4th Marines in Ramadi, Iraq, as part of the 31st Marine Expeditionary Unit. On April 6, 2004, during the Battle of Ramadi, Gentile was shot in the face by an AK-47 round that severed a carotid artery. He evacuated off the battlefield for lifesaving surgery in Iraq, then to Germany and eventually to Bethesda Naval Hospital. The combat wounds have resulted in 41 surgeries and caused him to speak openly about his injury and his faith. Gentile is a second-year graduate student pursuing a master’s degree in information technology. He and his wife, Megan, have four children and currently live in Lee’s Summit. Timothy Hornik is the recipient of the Bill and Shanthi Eckert WWS at KU. Hornik is a native of Chicago, a retired U.S. Army captain and the CEO of Blind Not Alone LLC. In 2004, while serving in Iraq as an Air Defense Artillery platoon leader, he was shot in the head and consequently blinded. Despite his injuries, Hornik obtained a master’s degree in social work from KU in 2010 and is currently pursuing a doctorate in therapeutic science at the KU Medical Center. He plans to use his degree, along with his considerable social work case management experience, to assist and advocate for disabled veterans. Hornik, his wife, Cate, and their two daughters live in Lawrence. Mackenzie Istook received the Heart of America Patriot Foundation WWS at KU. Istook is a third-generation Jayhawk, with her mother and two grandparents attending KU before her. She is a self-described “Army brat” and has lived in seven different states, three foreign countries and attended nine different K-12 schools. Istook’s stepfather, Sgt. First Class Jonathan Tessar, a Green Beret, was killed Oct. 31, 2005, by an IED, along with three other soldiers, on a mission southwest of Baghdad, Iraq. Her mother has since remarried, and her stepfather and two older siblings currently serve in the military. Istook is a junior at KU majoring in visual arts with a minor in business. She remains active in the Kappa Kappa Gamma sorority and with her coursework. Corey Leach is the recipient of the KAMO Adventures WWS and the Paul & Donna Peters WWS. Leach grew up in Olathe and enlisted in the U.S. Army in 2011. While on a foot patrol in Paktika Province, Afghanistan, he stepped into an IED blast zone and suffered severe injuries to his neck, vocal cords, left eye, shoulders and left leg. After completing extensive rehabilitation, Leach was medically retired from the Army in 2014 and entered KU. He is majoring in exercise science and is determined to reach his goal of becoming a physical therapist and working with veterans and athletes. Maria Santiago is originally from Puerto Rico and the recipient of a KU WWS, the Kansas Military Scholarship and KU Nontraditional Student Scholarship. Santiago served as a Marine in 1st Marine Division at Camp Pendleton, California. In June of 2008, Santiago deployed to Iraq when her daughter was 9 months old. Santiago served as a member of a female search team based out of Al-Taqaddum, Iraq. During her deployment, she witnessed and experienced the tragedies of the war across Iraq, and they left lasting scars. Following her honorable discharge from the USMC, Maria decided to attend KU where she is currently a pre-aerospace engineering student with a minor in Spanish. Santiago and her daughter Ashley, age 9, currently reside in Shawnee. The Office of Graduate Military Programs established the Wounded Warrior Scholarship Fund in 2012 through KU Endowment. The first two scholarships were awarded for the 2013-2014 academic year. “The ability to offer eight scholarships this year clearly demonstrates the dedication the university, its alumni and our local community to our military veterans,” said Randy Masten, the assistant director of Graduate Military Programs. The scholarships honor the unique sacrifices that service members and their families make while securing our freedoms, according to Mike Denning, director of the Office of Graduate Military Programs. Donations can be made by contacting KU Endowment at http://kuendowment.org/warriors. Photo, from left: Josh Blake, Mackenzie Istook, Corey Leach, Arnold Dinh, Jimmy Gentile, Tim Hornik, Maria Santiago and Luke Dercher.